Charismatic Alyaksandr Lukashenka was elected 1994, when Belarus had its first and so far the only relatively free presidential elections. Lukahsenka won giving promises of cash, refrigerators and TV sets to Belarusians impoverished as a result of the Soviet Union collapse. Following the decades of Soviet rule, the country had no well-rooted traditions of democracy or even its own statehood. As a result, civil society and national identity in Belarus was weaker than in any other Soviet republic. The prospects of populist politicians such as Lukashenka looked particularly bright. As a highly industrialized and export-oriented country, Belarus depended in early 1990-s on Russia’s markets and raw materials. President Lukashenka skillfully courted the Russian political elite by introducing Russian as the second official language, favoring Russian military bases in Belarus and constantly promising Russia a reunification. The country’s pro-Russian foreign policy starkly contrasted with those of Lithuania, Latvia and Ukraine were increasingly pro-Western and pro-NATO. The post Cold War political elite of Russia viewed Belarus as its only outpost in the West. Lukashenka’s hope was that Russia would support Belarus in the West a similar manner as the Unites States supported Israel in the Middle East. Russia was happy to pay for this demonstration of loyalty. For many years, the Russian Government has been heavily subsidizing the Belarus economy by providing subsidized natural gas and oil. The cheap natural gas helped inefficient Belarusian enterprises to survive. The discounted oil had been processed and sold to the West at much higher prices. In addition, Belarus was often used by Russia as an intermediary for selling military equipment to “rough” states and other murky dealings. All that helped the Belarus regime to survive and keep the economy under state control without almost any foreign investments. Unfortunately, cheap oil and gas are usually detrimental to democracy and Belarus was not an exception. Its political parties were turned into small clubs of dissidents, opposition received zero access to state electronic media and virtually all employees were transfered to short-term contracts which made them dependent upon their employers. With most of the economy owned by the state that meant that people were afraid to protest because of the fear to lose their jobs. While courting Russia, Lukashenka tried to make sure that the civil society in Belarus, particularly media, and political institutions were under his tight control. As a result, by the end of the 1990-s the parliament and the courts had been replaced with rubber-stamp institutions bowing to the presidential administration. The nearly wiped-out civil society makes Belarus very different from Ukraine and Georgia which had relatively independent media, parliaments and judiciary during their “revolutions”. Russia was always helping the Lukashenka regime at difficult times. 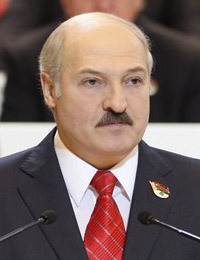 When he was nearly impeached by the Belarusian Parliament during very early years of his rule, the Russian prime minister and speakers of both Russian houses of Parliament came to Minsk to rescue Lukashenka. Quite often, when the United States or the European Union imposed sanctions against Belarus for human rights violation, Russia’s immediate response was to provide even more economic aid. Recently Russia started to demand something more tangible than anti-Western rhetoric from Belarus for its economic aid. In particular, Russian businesses are interested in privatizing Belarusian companies and the Russian political elite cannot see any real steps towards the promised re-unification of two countries. Reducing subsidies to the Belarusian economy made Alyaksandr Lukashenka look elsewhere to keep the economy going. Meetings with top European politicians, joining the Eastern Partnership and launching more creative projects such as exporting oil from Venezuela were the steps in that direction. It is difficult for the European Union to ignore Belarus which borders three EU member states and is an important European transit hub. It is also not in Europe’s best interest to leave Belarus to Russia. For Russia Lukashenka is still better than an uncertain alternative president, no matter how pro-Russian he sounds. Almost a decade ago, Russia supported Miloshevich not because he was the most pro-Russian politician of the region, but because he was the most isolated from the West. Lukashenka understands what drives Europe’s and Russia’s policy towards Belarus and tries gain something both from Europe and from the West to ensure that his regime survives. It would be naive to expect that this presidential elections are going to be fundamentally different from the ones it had in the past. True, Belarus authorities registered a number of alternative presidential candidates, introduced some minor changes to its elections regulations and the police so far seems to be less brutal. However, this cosmetic refurbishments have not affected the substance of these elections. According to the Organization on Cooperation and Security in Europe around 86% of all information in electronic media is about Lukashenka and is positive. All nine alternative candidates have just 14% and they are portrayed almost exclusively in negative light. In addition, the votes are unlikely to be counted. The election committees consist of the very same people who falsified elections in the past. The central election committee is chaired by the notorious Lidia Yermoshina, who was banned from traveling to the European Union and the United States for ridging Belarusian elections. In her safe hands the result is going to be exactly as Mr Lukashenka wants it to be. 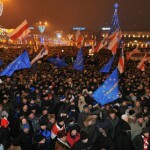 The opposition candidates urged their supporters to come to the main square of Minsk to protest. Thousands will come out tonight. But it would take tens of thousands to make any real impact. Not surprisingly, the elections are held at the end of December, when Belarusian winters are particularly cold. The authorities even took care of removing tents and sleeping bags from Minsk shops and made a huge skating rink in the middle of the square where the protests will take place. First, if the elections are rigged they should not be recognized. Europe and the United States did it many times in the past and there appears to be little reason not to do it this time. Second, it is important to help Belarusian civil civil society, and in particular its media. If the eyes and the ears of the Belarusians are closed how can they make a choice in favour of democracy, let alone defending it? After all, most people in Belarus do not really know what democracy is.